Slip and fall attorneys in Los Angeles can take your case when you’ve fallen and suffered a serious injury. Luckily, most falls don’t result in injuries. You just slip and fall and then get on with your day. However, unfortunately, not all falls are like that. Some lead to injuries that require months of rehab or longer, and some of these injuries can’t be recovered from. When that occurs, you need compensation for what you’ve gone through. That’s where the LA Injury Group comes in. They can work with you to ensure that you get what you deserve for all of your pain and suffering. It can be easy to forget just how painful and devastating a fall can be. Sometimes, no matter how careful you are, the owners of a location can be negligent. When their negligence leads to a dangerous situation, it can absolutely cause a serious injury. Those situations are what the LA injury Group’s slip and fall attorneys can help with. When the injury is something that can’t be “walked off,” you deserve to have someone on your side to help you get what you deserve. Sometimes, injuries occur in a slip and fall cases that doesn’t exactly show up in physical, bruise form, can but cause lasting damage. For example, take spinal cord injuries. They can be an all too common side effect of a slip and a fall. They might not show up in a picture, though. Also, they may not show up immediately. If they appear later on and cause problems at work (such as you losing some of your earning power) then you deserve to be compensated for those lost wages. Broken bones and herniated discs are also, alas, common injuries associated with slipping and falling. A “herniated disc” is when something happens to your spine, usually some kind of trauma (like falling) that puts a significant amount of pressure on the nerves. This can lead to a pain that simply doesn’t go away. Surgery is often the only way to get some kind of respite from this pain. You shouldn’t have to pay for this surgery yourself, as it wasn’t your fault that you were hurt. That’s another place where slip and fall attorneys in Los Angeles can come in handy. Concussions are in the news more and more, it seems. Doctors and scientists have long known about these injuries, but they’re learning new things about them every day. Concussions and other traumatic brain injuries are also a common side effect of slip and fall accidents. Falling onto your head, even from a short height, can lead to lasting damage. Concussion and brain injury symptoms may not show up for weeks or even months after an accident. They often lead to continuing therapy and the like, which is absolutely the kind of thing you deserve to be compensated for. Those are just a few of the kinds of injuries that slip and fall attorneys in Los Angeles typically see. Obviously, there are many more kinds of injuries that can happen. The LA Injury Group understands that no two injuries are alike. Just as no two situations are 100% similar, neither are two cases. That’s why the LA Injury Group has such an experienced group of attorneys. They’ve seen everything that can happen in slip and fall cases. Now, they can put that experience to work for you in your case. 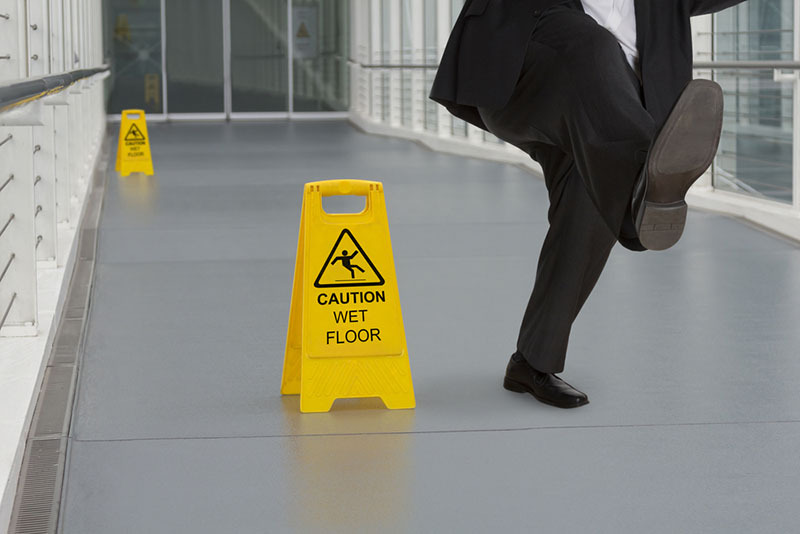 One thing slip and fall attorneys in Los Angeles often point out: they can happen anywhere. Sure, maybe they’re more likely to occur at the amusement park or some similar kind of location, but they can literally happen anywhere people are where they can fall due to the negligence of an owner or management. No matter how careful you are, you can still fall and suffer an injury if someone didn’t take good enough care of their property or store. There are few locations that the LA Injury Group does see more injuries at, however. Parking lots seem like they should be safe, but they aren’t always well maintained. The lighting is typically not great, and the railings, stairs and more sometimes are allowed to fall into disrepair. On top of that, in Southern California, parking lots are often very tightly packed, which can make moving between them difficult whether you’re on foot or in a vehicle. If you fall or get hit by a car due to the poor lighting or something similar, the owner can be at fault. In the aforementioned scenario, the driver of the car might be at fault as well. Even with the rise of the gig economy, most people still end up at grocery stores. Unfortunately, slip and fall attorneys in Los Angeles will tell you that’s where many slip and fall injuries can occur. You’ve seen all of those “caution” signs at grocery stores when there’s been a spill or some other kind of accident. However, should one of those signs not be out and you slip, fall and get injured, then the store (and others) will absolutely be liable. The same goes, by the way, for any public restroom you’re in. If someone else can’t get their location maintained and you get hurt, you shouldn’t have to pay. When you’ve fallen and gotten hurt in someone’s location, so many different things will be going through your mind. The last of which might be “I need to call an attorney.” However, that’s something you’re going to want to do as soon as possible. Obviously, the first thing to do is to get appropriate medical care. Your health is the most important thing to you and to those who love you. You don’t want to play games with that or wait around — make sure that you get your health taken care of, first. The second thing to do is to call slip and fall attorneys in Los Angeles. A big reason to call them so quickly is to begin the investigation of the accident site. In fact, if at all possible, you’re going to want to take as many pictures as possible of where you fell and how you got hurt. The more pictures you can take, the more evidence you can collect of what really happened. Then, when the insurance company (and others) try to spin the truth, you and your attorneys will have the evidence you need to show what really happened. Spills will be cleaned up. Skid marks will be eliminated. Anything in a store or other public location that caused your injury will be cleaned and taken away quickly, so you’re going to want the evidence of what really happened. Also: as soon as you’re hurt, the insurance company is going to send someone out to investigate. The LA Injury Group cannot say this enough: don’t give them a written statement. Don’t give them anything that they can use against you later to devalue your claim and give you less money than you should get. Any excuse they have to low ball you, the insurance company will take it. Hire the LA Injury Group, and then talk to them before signing or saying anything to anyone who works for an insurance company. Accidents where you slip and fall can be shocking and debilitating. When they occur, you deserve to be compensated for all of the pain, suffering and anguish that you’re going through. If you have to miss time at work, or (worse still) won’t be able to do your job as well (if at all) then you’re going to deserve compensation for that, as well. See what the LA Injury Group can do for you by calling (818) 210-4558 or going to their site to reach slip and fall attorneys in Los Angeles.